Total Hike: 8 miles Total Hike Time: 3:24 Avg. Pace: 1.8 mi./hr. 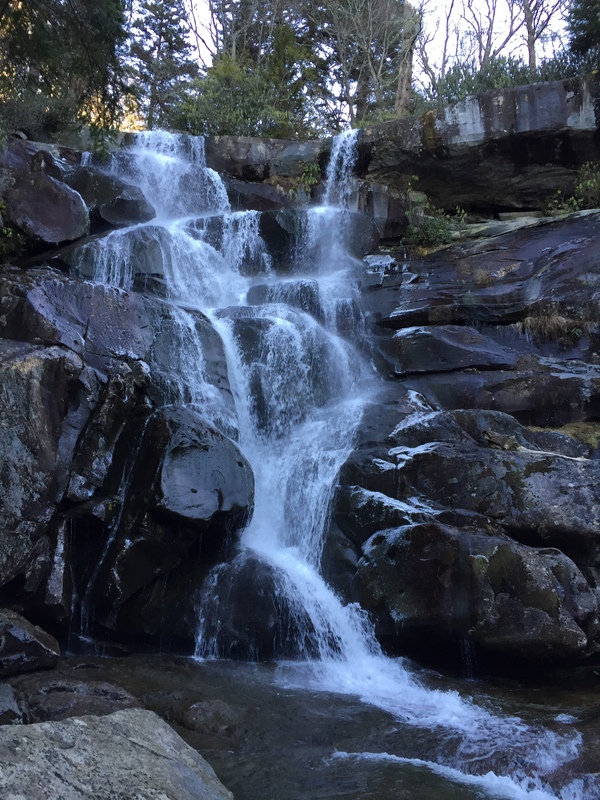 Ramsay Cascades is another crown jewel of the Great Smoky Mountain National Park and like most good rewards, it has to be earned, if for no other reason than just getting there. First, one must survive the madness that is Gatlinburg but if you are willing to get an early start, you can manage to miss the flood of humanity, both biped and automobiled, that engulf the streets. 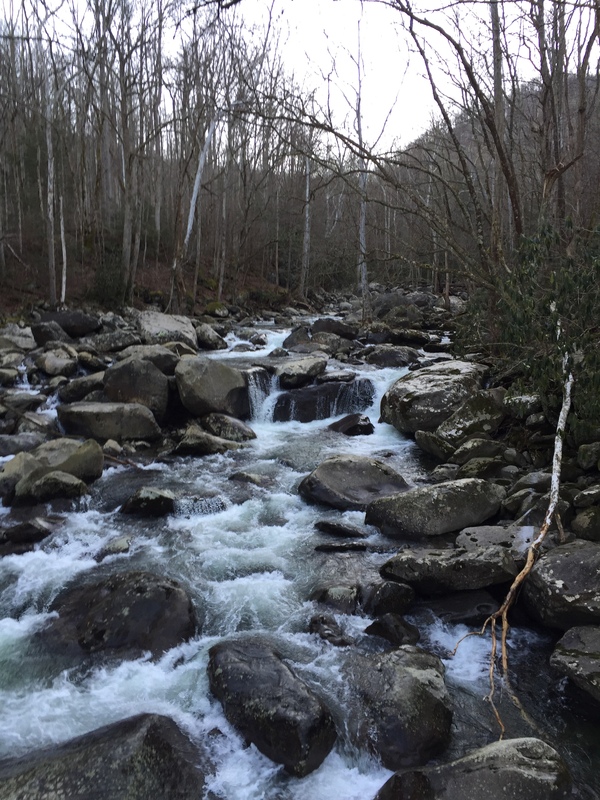 The Greenbriar Park Entrance is located along US 321 about 6 miles northeast of Gatlinburg. Less than mile in, the paved Greenbriar road stops at the ranger station and becomes a gravel road, sometimes narrowing to a single lane. Just past 3 miles in, the Ramsay Prong road turns left across a single lane bridge and continues for another mile and a half to a parking area at the trail head. Those arriving early should find ample parking but beware a midday start. This is a very popular trail and the small primitive parking area tends to fill up. 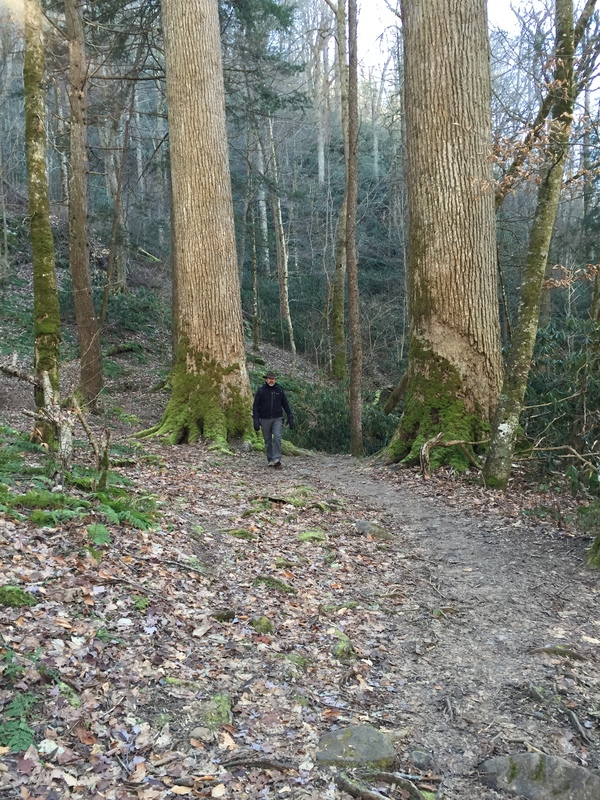 Having navigated a virtually empty Gatlinburg, we arrived at the trailhead about 8:45. Ramsey Cascades Trail does not tie into any other trail section so it can only be hiked as an out-and-back. We set off hiking at 8:53 with the thermometer reading 28 degrees. Ramsay Cascades Trail welcomes you through a portal that is a footbridge over the Middle Prong of the Little Pigeon river. The trail begins along a nice gravel road and climbs steadily after you cross the bridge following Middle Prong. Ramsay Cascades seems bigger than most trail experiences in the Smokies. The rapids in the streams seem bigger. 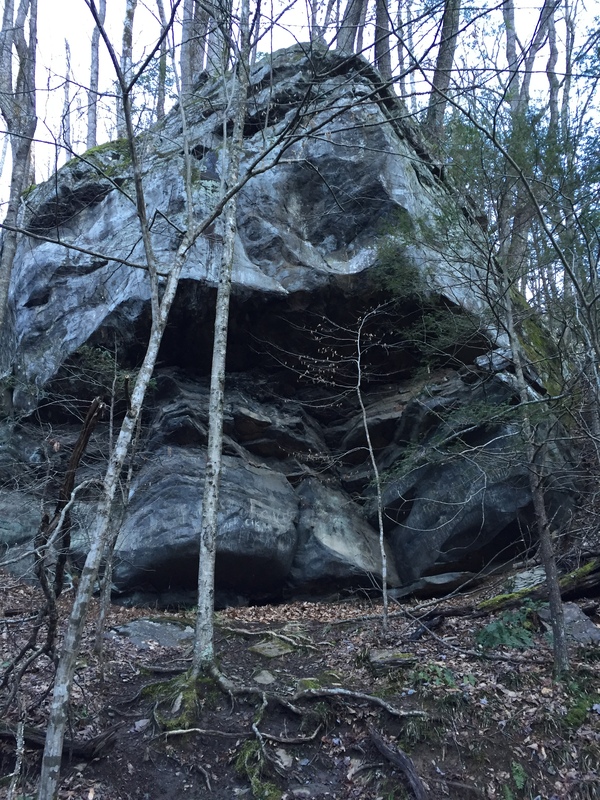 The rocks and boulders seem bigger and there are old growth trees that don’t look like they belong here. Then of course there is the waterfall that awaits you at the top. Green moss and rhododendron exude a fairyland atmosphere, even in wintertime. John Muir would ponder the rock formations of Yosemite, wondering how they got there and how they were formed. Similar thoughts occur as you pass along huge boulders and witness giant rocks strewn haphazardly along Middle Prong and Ramsay Prong. Just as Muir proposed how the rocks of Yosemite were living creatures, vital to the very foundation of creation, so too these rocks formations seem to have a personality and their creative placement along the way is shrouded in mystery. Then there are the trees. For some reason, in the lower section of the trail, several huge specimens of tulip poplars and locust trees were spared the harvest of the lumber companies prior to the establishment of the Park. Even as they die and fall, the souls of these mighty tree people still command a presence you can feel as you pass through a cut out section in a blow-down. 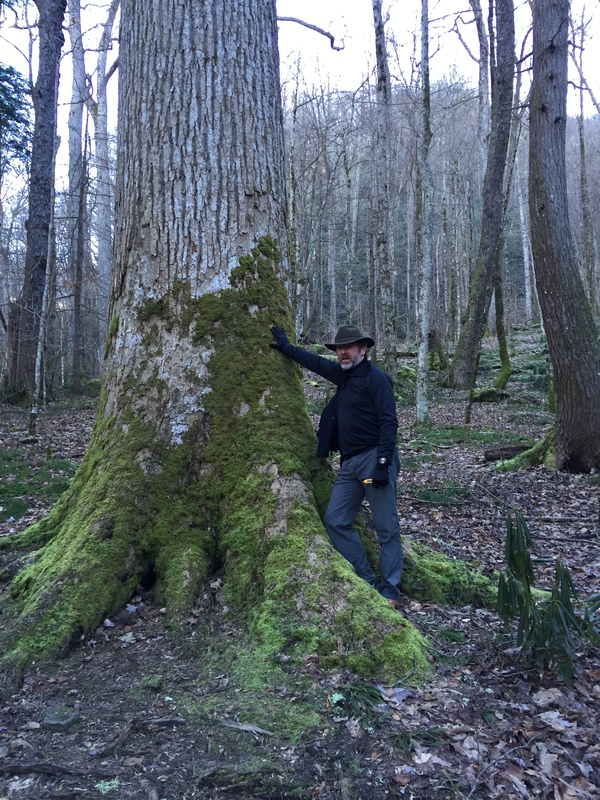 At 2.6 miles, you pass between two huge, straight tulip trees that the guidebook describes as majestic Roman columns. Although useful as a description, the grandeur of these trees cannot be captured in caparison to anything made by humans. For one thing, they are centuries in the making and will probably be here long after our temples have crumbled. Just a few hundred feet beyond the “Roman Columns”, there is a small clearing guarded by an even bigger tulip tree. A quartet of hikers managed to barely reach around the tree by holding hands as they circled its huge base. For me, the hike to this point was worth the effort, just to be in the presence of these living creatures that were here before humans were. 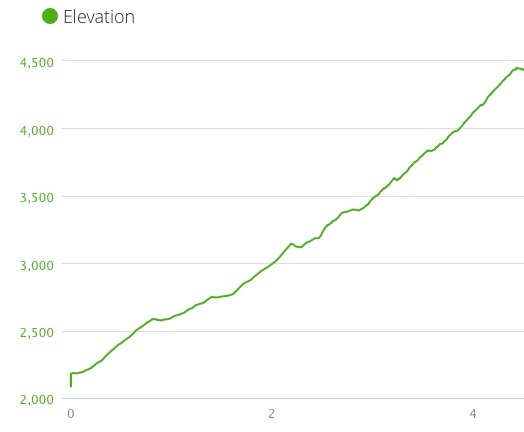 The last mile tests the hiker’s resolve as you gain 969 feet for a grade 18%. 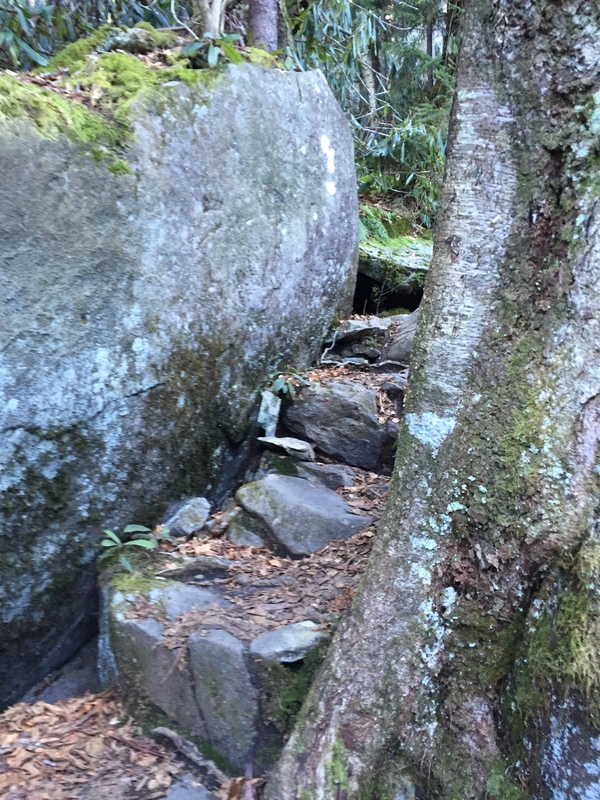 The trail is steep and narrow, often with steps to assist in the climb. Although the trial follows Ramsay Prong much of the way, providing a musical chorus, suddenly, the chorus reaches a crescendo as the waterfall comes into view. As we were scrambling over the few remaining boulders, I noticed an obvious footprint with 5 distinct toes. My companion and I had been discussing earlier the art of barefoot running and that transpired to barefoot hiking. I remarked that I had yet to see a hiker sporting the Vibram 5-Finger shoes, let alone a bare-footer. My Scout Craft proved true as we soon met the owner of the 5-Finger shoes at the top. At 10:45, we reached the rock ledge that provides a front row seat to a mighty rendition of water music. The 90 ft. waterfall lands in pool atop a section of flat rock that, even despite the subfreezing temperature, beckons a refreshing dip. To our fortune, we were the second pair to arrive, giving us the privilege of a private performance for more than 20 minutes. On a summer day, you may find 30 or more people here, many of whom have ignored the sign warning of certain death should one loose control of one’s children, and availing themselves of the cool water in the pools below the falls. Alas, the thermometer settled on 31 degrees as we donned more clothing and found our seats. New to my gear list is a pair of insulated mittens and a down jacket. These provided considerable warmth and comfort for the show that beset us. The other pair in our small audience, having left, were soon were replaced by a trio who set about taking pictures and asking for our services as photographers. Of course we complied but by then, we were ready to head back down. The blessing of our early start was made more obvious by the number of people we passed on our descent. Our timing had been near perfect. 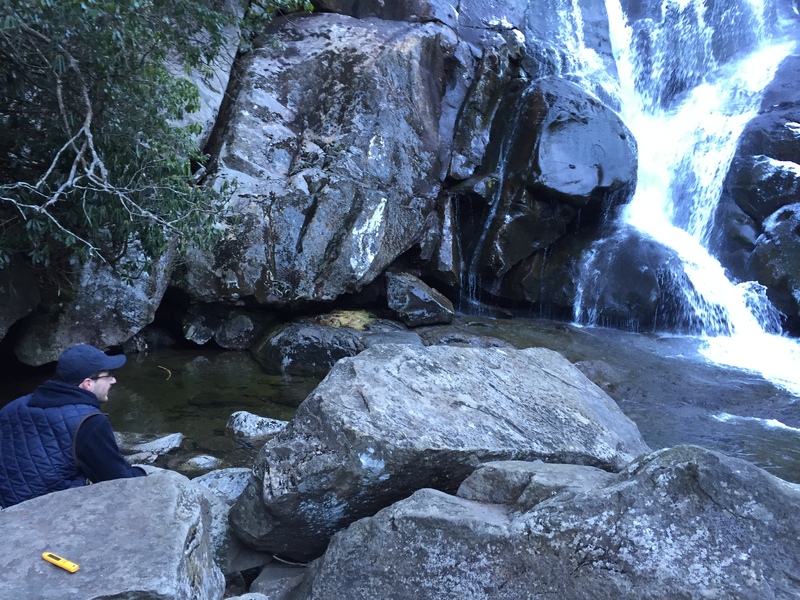 The nice thing about an out-and-back hike, especially when you are in a cathedral of trees and among sacred statues of rocks and boulders, is you get to see it all again. 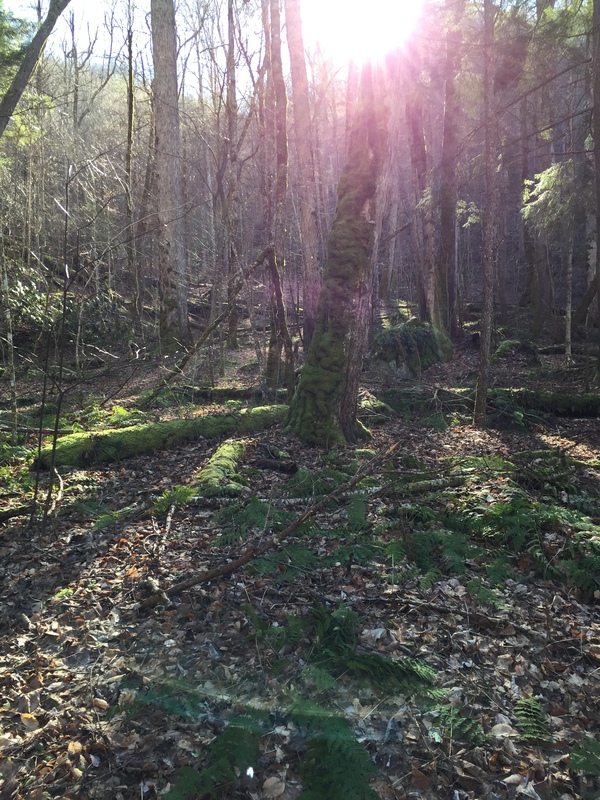 By now, the sun was above the ridges and the blue sky offered contrast to the green appointments of the moss and rhododendron. We assured our fellow pilgrims headed up that the arduous climb was indeed worth it. It was a few minutes after 1:00 when we arrived at the packed parking area. In a moment recalling a miserable experience at a crowded shopping mall, a fellow pulled up and waited for me to exit my parking space. He was polite but insistent nonetheless. This merely foretold of the mob scene that hit us after our descent into Gatlinburg. After a 20 minute journey to travel 3/4 mile, we celebrated the day with burgers at Smoky Mountain Brewery. And good burgers they were. My thanks to my hiking partner, Bryan Shuler, who provided company, conversation and modeling services for my photographs. 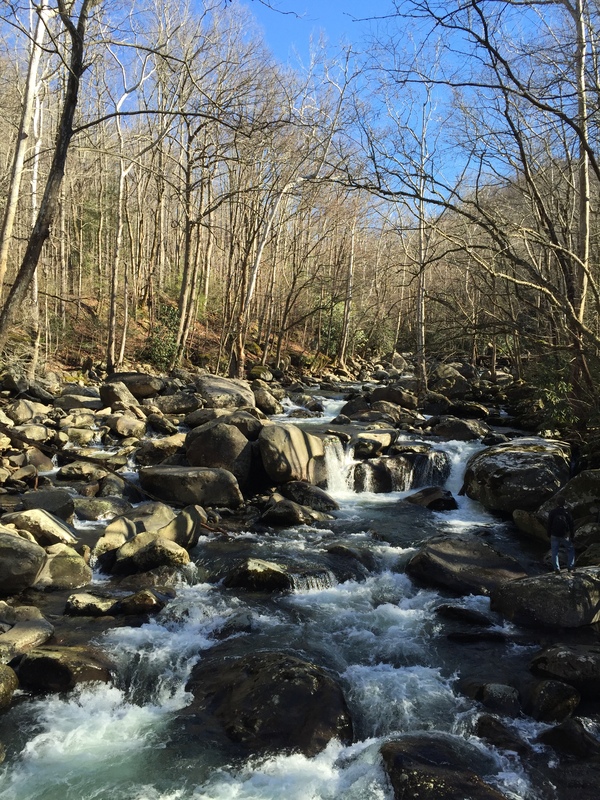 This entry was posted in Trail Log and tagged Great Smoky Mountain National Park, Greenbriar, Ramsay Cascades on January 2, 2016 by blogginggazelle. Enjoying vicariously your quest for the 900 Mile Club and the great trail descriptions, Shawn. Would love to do that myself. Somehow I thought you had already accomplished that. Keep up the good work! Hi Don. Thanks for the comment!!!! I had completed it so I started another round and began this blog as a way to document it. The thought occurred to do a blog about a year ago but I was already mostly done so it didn’t make sense. Only 743 miles to go!